King Karl has done it again. Within moments of the Grand Palais opening, Twitter and Instagram were abuzz with news about the Chanel set design. Every season, the Chanel set becomes a talking point in their own right. We've seen full, working carousels, melting icebergs, realistic forests and even a barn housing a singing Lilly Allen, which is in fact her natural habitat having the voice of a domesticated barn fowl. Yesterday, Karl and Co boldly went where no fashion insider would ever expect to find luxury: the supermarket, well that's if they've never bought anything from the Tesco Finest range, and have an overwhelming urge to believe the hype. 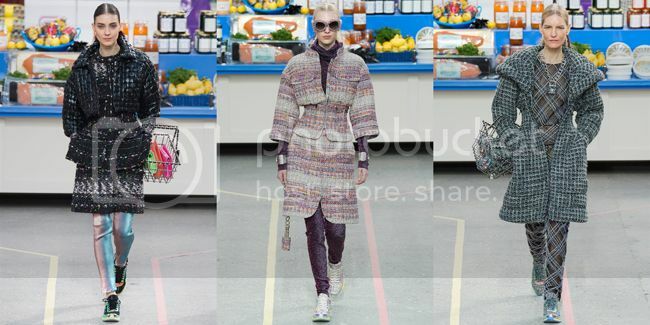 For their autumn winter show, Chanel designed a life-sized superstore complete with Chanel branded produce. Chanel eggs? Chanel rice? Even a Chanel broom could be found by 'shoppers' wandering the aisles. Every square inch was painstakingly designed to fit the rhetoric, as models pushed Chanel trolleys up and down the 'runway' with the benign smiles of Stepford Wives. The show was a hit, to say the least, although the fashion itself was outshone by the elaborate set, which became interactive after the show. I daresay that Chanel branded washing detergent which doubtless is being is being flogged on Ebay as we speak. The fashion was kind of an upmarket version of weekend wear. Track suits, trainers and quilt-trimmed shopping baskets brought a nostalgia for that early noughties staple: the Juicy Couture tracksuit. The whole collection was as casual as Karl would dare, but still super luxe and beautifully crafted but can baggy joggers ever be luxury, is it finery or just finessing your "finest". Over at Moschino last week, Jeremy Scott borrowed inspiration from the Ronald McDonald school of fashion and presented a debut collection brimming with recognisable brands. He even had his own 'Golden Arches' served up by a uniformed model and incorporated Fruit Loops, Sponge Bob and Hershey's packaging into his designs. The final look was a wedding dress printed with the nutritional information you'd find at the back of your favourite pack of crisps. 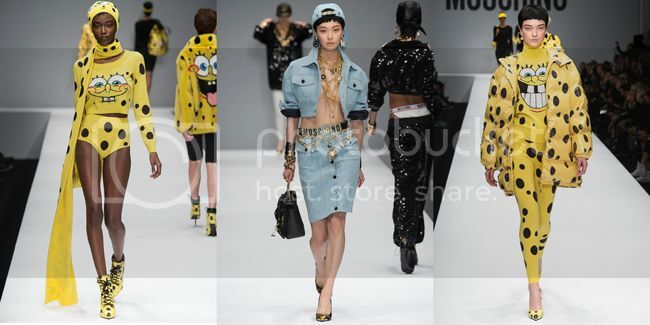 The collection was an ode to junk food and alongside the brands, the Moschino logo shone out on belts, appliqués and hats. These shows both represented great examples of brands poking fun at themselves, but also provided uncomfortable commentary on our commercial and consumerist culture. At Chanel, surely it was a statement on how pedestrian high fashion brands have become, if you could pick up a coveted, logo-covered product in the most urbane of settings. Ironically, the brands themselves have created most of the problem, with out-of-control licensing and over saturation to the point where luxury goods cease to be true luxury is it a case of "pop-fashion eating itself?". There is of course a couple of other ironies that collections like this highlight. Of course every year without fail comes the debate about models' size, weight and now more than ever in the wake of too many scandals to mention, the age of girls modelling. Sending models down in couture crisp packets and candy bag frocks creates an ever more chilling statement. Also are we cynical to wonder if the production company really read things right sending a black model down in a Hershey's dress?But this is Italy, not a country known for its adherence to Political Correctness, but it does make you wonder what goes through people's heads, and what the model herself though, take away the logo it was a truly amazing dress worn by a stunning woman, add the logo, well Houston we have a problem. Perhaps yesterday's show marked a change in the weather and maybe fashion needs to regain some of its old exclusivity. Let's hope in doing so, it retains its wicked sense of humour.